KRZYCKI, Leo. The Unions and the Socialists. COBLENTZ, L. A. Russia, up to date: As seen by a Minnesota Farmer, together with an account of the world's most horrible atrocities. BARCLAY, Hartley W. Red Labor Marches in Mexico. KOPLIN, Edward (photography & graphic design); FIORITO, Frank (text); Newark Teachers Union. The Anatomy of a Strike: The Newark Teachers Union/February 1, 1970 to February 25, 1970. HOYLES, Andree. General Strike, France 1968: A Factory-by-Factory Account. Endicott-Johnson. We": The Story of an Industrial Democracy Unique in Business History. From Law and Disorder On the Narova River to The Politics Of Immigrant Workers Labor Activism and Migration In the World Economy Since 1830, from	Industry In Latin America to The "Blast!, we can help you find the labor history books you are looking for. As the world's largest independent marketplace for new, used and rare books, you always get the best in service and value when you buy from Biblio.com, and all of your purchases are backed by our return guarantee. New York: Pioneer Publishers, 1956. First edition. Saddle-stapled, salmon-colored wrappers printed in red; 40 pp. ; illustrated. Commemorative booklet authored by the Trotskyist and leader of the Socialist Workers Party, James Cannon. A Near Fine copy. Chicago: Charles H. Kerr and Company, 1901. First edition. Twelvemo. Publisher's decorative cloth; 199 pp. ; photographic frontispiece of the author. With the stamp of 'Wm Bonstein's Library of Science and Socialism' to the endpapers. William Bonstein appears to have been an unimportant Socialist Labor Party candidate in Washington state during the 1904 election. The author was a Belgian statesman and democratic socialist and in this book argues for collectivization as a core attribute of socialist evolution. Cheap paper browning; rear board slightly soiled, but easily a Very Good+ copy. Uncommon in the first edition. Chicago: Socialist Party of U. S. A., [ca. 1933]. First edition. 8vo. ; red, stapled, letterpressed wrappers, 15,  pp. The author, chairman of the Socialist Party USA and vice president of the Amalgamated Clothing Workers of America, argues for cooperation between unions and Socialists in their two-pronged approach "to gain for working people the largest possible amount of wealth which labor creates." A couple of marks to the front wrapper, else a fresh, Fine copy. Washington, DC: American Federation of Labor and Congress of Industrial Organizations (AFL-CIO), 1959. Stapled wraps. Very good. [28p.] Cover edges lightly worn. B&w illustrations and photographs. 8vo - over 7¾" - 9¾" tall. Red Lake Falls, Minnesota: Published by the author, [ca. 1940]. Square stapled wrappers; 63 pp. Coblentz, a self-described Minnesota farmer, provides a firsthand account of his trip to Russia, which he extols, while condemning capitalism, war and fascism. Wrappers show some wear and grazing, corners bumped, but a VG copy overall. Less than two dozen copies located in WorldCat. Minneapolis: The Labor Digest, 1910. 8vo (6" x 9¼"); stapled, illustrated wrappers, 39,  pp, photographs. A single issue of this moderate labor union journal edited and published by E. E. Stevens in Minneapolis. 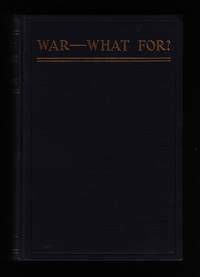 Content includes: "Payment for Industrial Accidents," various poems and snippets for young boys, girls and women, an editorial, "Railroads Again Victims of the Political Game," many small articles of interest to a labor audience, fiction by Roland Ashfyrd Phillips ("When Love's Afield"), recent inventions and technical news, miscellany, etc. Many photographs throughout of individuals, equipment, inventions, with adverts in the rear. Wrappers are dust-soiled with biopredation evident and some light chipping along spine and bottom edge; blue soiling to rear wrapper and a 3" x 5" chunk missing from pgs. 7-8. A reading copy only. Scattered issues appear over a dozen or so institutions in OCLC. [Kohler, Wis.]: [Kohler Co.], 1957. First edition. 12mo. ; stapled wrappers, 20 pp. ; black & white photographs throughout. An address given by Herbert V. Kohler, President of Kohler Co., before The Economic Club of Detroit, Monday, February 25, 1957. A protracted labor dispute began on April 5, 1954 between 2,000 striking workers and the Kohler Co. and lasted for over six years becoming the long major strike in American history. During those turbulent six years, much propaganda was churned out on both sides, each accusing the other of terrorism and violence. In this booklet are photos of union violence against non-striking workers, as well as the bucolic Kohler Village. Scarce in the trade with less than a dozen copies found institutionally via WorldCat. London: Labour Party, 1935. 4to (8½" x 11"); stapled wrappers, 178-192 pp, illus. A single issue of this monthly Labour Party periodical begun in 1913 and devoted to the interests of women. Content for this issue includes a profile of Labour Party leader and Nobel Peace Prize winner, Arthur Henderson; an article concerning equal pay in the state service; impressions from two different women on traveling to Sweden; a literary contribution from the Belgian writer, Maurice Maeterlinck titled, "What Tyltyl and Myltyl Saw on Christmas Eve; book reviews; and other tidbits. Center fold with small closed tear at fore-edge, toning to wrappers; VG overall. We note no other copies currently for sale (Sept., 2018). [New York]: Metropolitan Life Insurance Company, 1913. First edition. 19.5 x 13.5 cm; 24 pp. ; photographs. Illustrated, stapled wrappers in very good condition with some general rubbing and creasing to corners; some splitting to spine ends. A scarce pamphlet published for the policy-holders of the Metropolitan Life Insurance Company. Rarely seen in the trade; less than 20 copies found in OCLC. Baltimore: Firestarter Press, 2003. Reprint. Stapled, photocopied wrappers, 64 pp, illus. First issued in 1991, this pamphlet comprises a number of documents - most originally in Kurdish - of the 1991 Kurdish uprising in Iraq. Many of the documents are primary source statements and letters written by Kurdish workers involved in the 'shorahs' or "councils." Provides rare insight into the lives and politics of the Kurdish workers who opposed both the Kurdish Nationalist Shop Front and the Western allies. Light rubbing to wrappers, else Fine. Two copies of any edition found in WorldCat. [New York: Conover-Mast Corp.], . First edition. Large 4to. (30 cm), illustrated wrappers, 31,  pp. ; photographs. Originally printed in the October 1938 issue of "Mill & Factory," the business writer and manufacturing consultant, Hartley Barclay, surveys the increasing Communist takeover of labor in Mexico and the expropriation of private American industry. Many photographs of Communist-organized rallies and demonstrations with a special focus on John L. Lewis' visit. Barclay was editor of "Mill & Factory" and director of the Conover-Mast Corporation from 1931-1942. Rubbing to wrappers with some grazing to edges and a few nicks. Less than two dozen copies found in WorldCat institutions. New York: American Civil Liberties Union, 1930. First edition. Octavo. Stapled, plain wrappers with North Carolina map to front cover; 14 pp. A scarce and important report on the violence perpetrated against organized workers in Gastonia and Marion, NC. The information is organized in the form of a timeline for 1929, during which 7 strikers were killed, 24 wounded, 7 sentenced to long prison terms and 7 kidnapped. Key events and participants are summarized. The ACLU helped with the defense of arrested workers and created this pamphlet "to state the facts and to help arouse public opinion." A Fine copy. Scarce. Bern: Steiger & Cie, 1889. First edition. 23 cm; 80 pp. Orange wrappers printed in black; uncut pages, which are browned from age. Some chipping to the spine, although covers are still firmly attached; small stamp to both front wrapper and title page. German text. [Detroit? : n.p. ], 1949. First edition. Saddle-stapled, photo-illustrated wrappers;  pp. ; illus. A scarce pamphlet in honor of Communist labor organizer, Bill McKie's, 72nd birthday. McKie was a Scottish-born member of the Sheet Metal and Braziers Union who emigrated to the U.S. in 1927 and began organizing a union at Ford. He was an inveterate Communist and as evidenced by this pamphlet, a much-loved union organizer. Includes a tribute by leaders and rank and file members at Ford; facsimile letters of congratulations from Thomas Thompson, President, Local 600, UAW-CIO, Carl Winter, Chairman, Michigan State Committee Communist Party, and the Secretary of the Scottish Committee Communist Party. Roast turkey was on the celebratory menu and dinner music by Hope and Harold Smith. No other copies in the trade (Sept., 2016) and only one copy at the Univ. of Michigan in WorldCat. Some light wear and soiling to wrappers, but VG+. New York: National Executive Committee, Socialist Labor Party [of America], 1921. First edition. 18.5 x 13 cm; 16 pp. Saddle-stapled light green wrappers printed in black. A Near Fine copy with some slight browning to wrapper edges. You're unlikely to find a copy so well-preserved in your pinko commie uncle's attic. Scarce. No other copies for sale in commerce (2014) and OCLC locates only six institutional holdings. Post-De Leon propaganda from the SLP encouraging railway workers to embrace socialism and thus "extricate themselves from the vicious circle of capitalist chicanery, growing out of capitalist exploitation. Cleveland: Cleveland District Auto Council, 1961. First edition. Saddle-stapled wrappers; 36 pp. A scarce booklet published by the Cleveland District Auto Council proposing an international auto union organization to benefit both European and American auto workers. One copy located at the Ohio Historical Society. A Fine copy. Washington, D. C.: Bituminous Operators' Special Committee, 1922. First edition. Quarto (27 x 20.5 cm). Textured, saddle-stapled wrappers; 32 pp. A study on conditions in bituminous coal fields across the U.S. Scarce. Some rubbing and browning to wrappers; Very Good. New York: Freedom of the Press Co., Inc, 1951. First edition. Stapled, illustrated wrappers (19 cm) printed on newsprint; 16 pp. Scarce CPUSA publication concerning the unsolved murder of Italian-American longshoreman, Pietro "Pete" Panto (1911-1939), at the hands of Albert Anastasia's Murder Inc. for attempting to expose the corruption that existed in the International Longshoreman's Association. Singer, a Communist journalist, contends that the Kefauver Committee refused to convict the known Mafia associates who killed Panto because the mob was doing the bidding of powerful shipowners. Browning to newsprint, but an about Near Fine copy. No other copies currently in the trade; seven institutions with holdings in WorldCat. [Carbondale, PA? ]: Carbondale Central Labor Union, 1966. First edition. Quarto-size. Yellow, stapled wrappers printed in black; 12 pp. ; photographs. Issued by the Carbondale Central Labor Union (Lackawanna County). With photographs of prominent figures and a listing of union organizations, members, and with adverts to pay for the whole thing. A Near Fine copy. Newark: Newark Teachers Union Local 481, American Federation of Teachers, . First edition. Oblong octavo (7.25" x 9.5"); photo-illustrated, stapled wrappers; 108 pp. ; photographs. A largely photo-illustrated account of the Newark Teachers Union strike against the Board of Education, which lasted almost the entire month of Feb., 1970. 3,000 of the city's 3,800 teachers, aides and clerks participated in the month-long strike shuttering approximately 95% of Newark's public schools. The strikers were harassed and dozens of NTU officers and members were arrested, while the courts sent sheriffs to confiscate all of the funds of the Union and all its records. The strike gained support from other labor organizations, some of which sent representatives to Newark in solidarity. Ultimately the strike was successful and the NTU won consequential gains for its members. Some rubbing to wrappers, but an about Near Fine copy. WorldCat locates only five copies, with three of those in NJ libraries. Palo Alto: New York Daily News, 1975. Third printing. 12mo. Red and black-printed, staplebound wrappers; 58,  pp. Price sticker to front wrapper, Near Fine. [Chicago]: Sojourner Truth Organization, [ca. 1969]. 8vo. ; stapled wrappers, , 44,  pp., photographs. Initially published in 1969 in the "Trade Union Register" in London, this booklet attempts to describe the revolutionary struggles in the factories of France during the uprisings in 1968. Rubbing and minor soiling to wrappers, else Very Good. An uncommon pamphlet published by the Sojourner Truth Organization, a new communist organization founded in 1969. Los Angeles: The Freedom Club, First Congregational Church of Los Angeles, California, 1956. First edition. Illustrated, saddle-stapled wrappers; 16 pp. (includes covers); photographs. An address given by Herbert Kohler, President of the Kohler Co., concerning the protracted labor dispute between over 2,000 striking Kohler workers and the company. It began on April 5, 1954 and would last for over six years becoming the longest major strike in American history. Kohler found sympathy from the conservative Dr. Fifield and his Congregational Church, purported to be the largest Congregational Church in the world at the time. A Very Good copy with some slight soiling and toning to plain wrappers. Uncommon in the trade with only eight copies found institutionally via WorldCat. Endicott-Johnson, [ca. 1927]. First edition. Oblong, photo-illustrated wrappers; 80 pp. ; illustrations, map, photographs. A scarce souvenir booklet issued by the Endicott-Johnson shoe company, an industrial democracy in upstate New York. The company's history and "Square Deal" program is largely told through photographs and illustrations. Under the influence of co-owner, George F. Johnson, who'd risen through the ranks to his position, Endicott-Johnson offered its employees generous benefits and amenities and the company boasted high production, low turnover, no strikes and a prosperous company town. Some rubbing and wear to wrappers with some penciled numbers and light soiling to rear wrapper; a VG copy. We find none others currently offered in commerce (Nov., 2017) with less than 10 copies located in WorldCat.